CIT will be conducting a video production workshop for SW4202 Communications and Social Work Practice students in February. 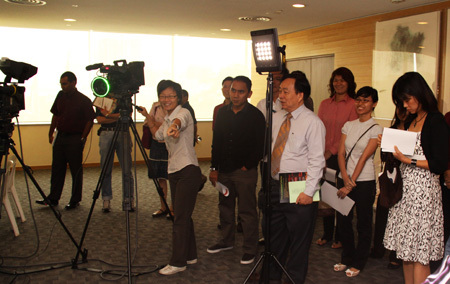 Students will learn the art and science of video production, which will enable them to produce videos relevant to their work as well as to assess the quality of videos used in Social Work. Posted in What's New and tagged audio-visual services, social work on 22 January 2009 by Kenneth PINTO. CIT staff demonstrating a portable green screen solution used for backgrounds and effects. CIT conducted an Audio-Visual Awareness Roadshow on Tuesday, 14 October 2008. This roadshow, the first of its kind in NUS, was aimed at increasing the awareness of the use of audio-visual products and services in supporting teaching and learning. Educators gathered at the University Hall auditorium to listen to other educators’ experience with using audio-visual technology in their lessons. Dr Adrian Michael Lee, Department of Chemistry, and Dr Mohanan Karuvannur, Department of English Language & Literature shared how CIT produced videos for the Interactive Chemistry Laboratory Manual (ICLM) courseware and the Academic Knowledge & Inquiry eModule respectively. CIT created the videos which populate both e-Learning tools which help to disseminate important information efficiently to a large number of students. Dr Jacqueline Chin and Mr Voo Teck Chuan, from the Yong Loo Lin School of Medicine, discussed how CIT produced biomedical ethics videos to help medical students prepare for their objective structured clinical examinations (OSCEs). While CIT is better known for providing audio-visual production services, a little-known fact is that we also provide video production training. Mr John Ang, Department of Social Work, highlighted how CIT conducts a basic videography and editing course for his students. His students then make use of the skills to create a video as part of the course requirements for SW4202 Special Areas (Social Work and Mass Communication). In between the talks, CIT staff and our vendors showed participants various parts of the video production process from pre to post-production. Participants in the roadshow learnt the scope of CIT’s audio-visual services as well as what it takes to produce a full-fledged video. Photo by Leong Mun Wai. Posted in News and tagged audio-visual services, event on 15 December 2008 by Kenneth PINTO.